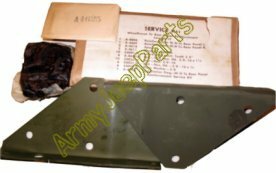 Rear panel reinforcement plates, original NOS with instruction sheet. Rear panel reinforcement bracket set.. We only have the NOS brackets remaining at this point. The kit will included a copy of the instruction sheet. All mid to late production jeeps had these brackets welded not bolted in so no hardware was needed. We have a limited Qty of these remaining.